The overview map is a small map that is inset in the main map. Often the overview map shows the main map in its larger context. The overview map is synchronized with the main map. When the user pans or zooms the main map, the overview also pans and zooms. The end user can show and hide the overview map. An overview map is not recommended for most modern applications, as it is easy to zoom out for quick context. One exception is a map that opens to a specific feature of interest—for example, a property parcel—from a third-party system, where the user has no idea where the feature is located and has no other reason to zoom out. The overview map is fully configurable. 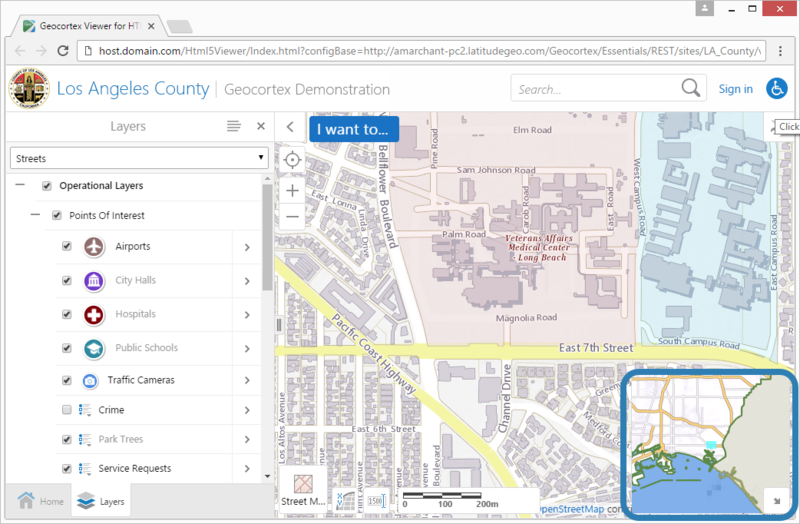 You can add and remove map services and feature layers, edit display settings, and add and remove layers, just as you do when you configure the main map. The spatial reference of the overview map must match the spatial reference of the map. In Manager, edit the site that you want to configure, and then click Overview Map in the side panel. Add the map services that you want to appear in the overview map. Set the initial extent and full extent. Change the settings for a service in the overview map. Pan and zoom the map image to the extent that you want to use for the overview map. For instructions, see Map Widgets. To remove the overview map, remove all the map services in the overview map.